Though Nixon stabilized relations with the USSR and China, his political activities within the US were highly controversial. Despite many positive contributions to his country, the legacy of the 37th President of the United States has been marred by the Watergate Scandal. Editorial credit: neftali / Shutterstock.com. Richard Nixon was born on January 9, 1913, in Yorba Linda, California to a Quaker family. His was immersed in evangelical Quaker doctrines and principles, and developed his iconic reserved character from an early age. His early life was marked by hardships, due to poverty and family illnesses alike. He was a very bright student all through his secondary education, and went on to attend Whittier College in his hometown, which still allowed him to tend to the needs of attending to family business. He then was offered a full scholarship to attend the Duke University School of Law. After completing his education at Duke, Nixon graduated third in his class in June of 1937. After serving in the US Naval Reserve for several years in the World War II period, Nixon was recommended to run for California Congress, and was successfully elected to a seat in 1946. Then, in 1950, he successfully ran for the United States Senate. As a Senator, became known for his ardent anti-Communist reputation in the Senate, which attracted the attention of the next US President, Dwight D. Eisenhower. Nixon was nominated as his Vice President in 1952, and they won the elections that year, as well as in the next cycle in 1956. After losing to John F. Kennedy in the 1960 Presidential Election in a bid for himself as the next Chief Executive, Nixon finally realized this goal in 1968, when he was elected as the 37th President of the United States by a significant margin in the Electoral College over Hubert Humphrey. 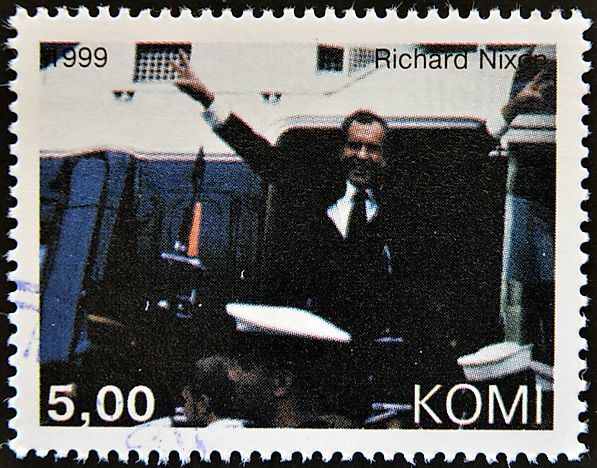 Although his term would ultimately end in one of the biggest political scandals in US history, during his six years of presidency Richard Nixon realized a number of crucial achievements. Domestically, his support was pivotal for the creation of the Environmental Protection Agency and, later, the passages of the Clean Air Act and the Clean Water Act, as well as the Mammal Marine Protection Act. But he is mostly remembered as a brilliant diplomat. He managed to establish benign relations with the two largest Communist powers. Namely, he reached nuclear arms control agreements with the Soviet Union, and established official diplomatic relations with China. Both of these actions greatly soothed the global tensions brought on by the Cold War. When Nixon took office, the Cold War was still at its peak, and posed severe challenge to the US. Causing massive casualties everyday, the Vietnam War was broadly protested within the country, and was losing its legitimacy on strategic, political, and moral grounds alike. Facing such realities and domestic pressures, Nixon promised to withdraw US troops and end the war. In 1973, he signed the Paris Peace Accords, effectively ending US involvement in the Vietnam War. The biggest challenge to his Presidency came with the "Watergate Scandal", referring to a wide range of illegal activities conducted by the Nixon administration and his campaigners in spying on his political opponents. The scandal was named for the Watergate Hotel Complex in Washington, DC, where the Democratic National Committee headquarters were broken into by Nixon supporters. The campaign and administration then tried to hide these actions. Facing the threat of being impeached over the scandal and subsequent cover-up, Watergate eventually forced him to resign. Ten months after Nixon's wife, Pat Nixon, died of lung cancer in 1993, Richard Nixon died of complications from a massive stroke himself on April 22, 1994, in New York City, at the age of 81. The couple was buried together at his birthplace in Yorba Linda, California. Today, Nixon remains a controversial figure. While he has often been despised throughout the time since his political career for allegations of using unjust means to win elections, he nonetheless did much for the greater good of his country. After serving in the US Armed Forces, the California state legislature, and the US as President, his contributions in domestic affairs, health and environmental research, and his pushes for more widespread enforcement of desegregation, are still notable. Furthermore, his brilliance in diplomacy are also praised, and show positive lessons to learn from for officials that follow in his wake, alongside the mistakes he made, which themselves serve as lessons regarding actions to never be repeated.